Excitement is beginning to build over at the Johnson Space Center as the date for a trip to the International Space Station by American astronauts grows closer and closer. You can feel it in the air as you walk up and down JSC’s halls and in the eyes of those working to make it a reality. 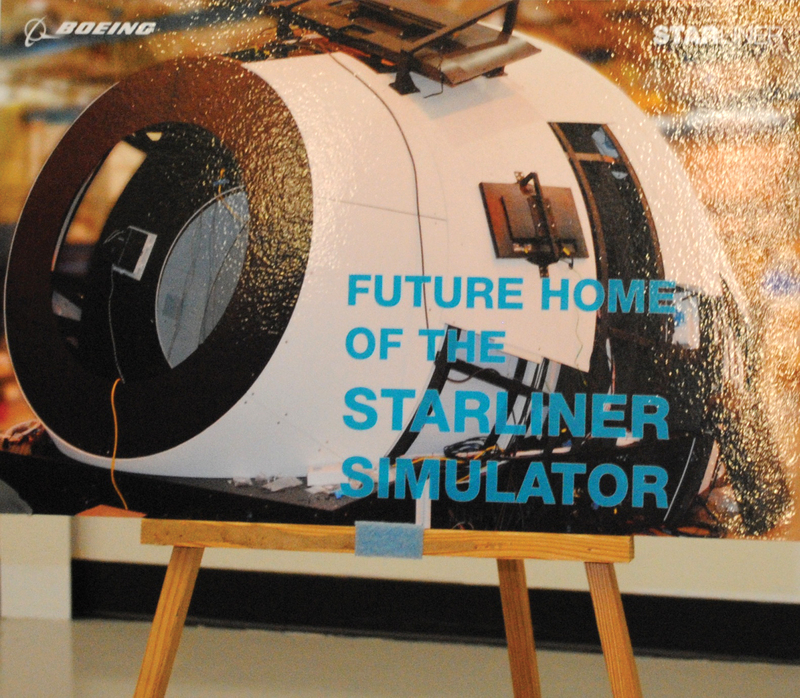 Boeing and NASA marked the installation of its new CST-100 Starliner spacecraft simulator systems by inviting area media to the historic Jake Garn Mission Simulator and Training Facility at JSC, where they were welcomed by JSC Director Dr. Ellen Ochoa and Boeing Commercial Crew Program Deputy Manager Chris Ferguson. “It’s handy for astronauts to have their offices just right across the way from the simulators. It makes it easy to do their training here, and we’re just really glad to see this come forward,” she added, going on to mention the unique relationship JSC has with Boeing through other current and past contracts. Others joining in the welcome included astronauts Suni Williams and Bob Behnken, JSC Commercial Crew Program Deputy Manager Steve Stich and Boeing Space Vehicle Program Manager Pete Meisinger. Boeing, awarded a $4.2 billion contract to develop the Starliner and one of two companies NASA’s Commercial Crew Program contracted to return crew launch capability to the United States — the other is Space X — invited media representatives to participate in a roundtable discussion with NASA and Boeing representatives and also observe astronauts operate the Starliner Crew Trainers. “This is a big project for Boeing,” Ferguson, a former astronaut said, explaining that Boeing also was training the astronauts for the journey to the space station. Currently, astronauts are training on Part-Task Trainers, which replicate flight conditions, including rendezvous and docking with the ISS, while the company is constructing a full-scale, high-fidelity Starliner simulator in St. Louis that will allow astronauts to practice all the aspects of a mission. Delivery to JSC is expect in early 2017. Besides Williams and Behnken, astronauts Eric Boe and Douglas Hurley also have been selected by NASA to train for the U.S. Commercial Crew missions.